Steve Rogers is about to return via Captain America: Reborn, a five-issue monthly comic book limited series scheduled for release between July and November 2009. 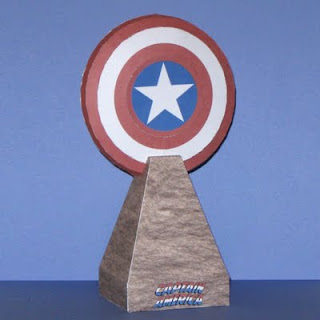 To celebrate his comeback, tektonten recolored his Tron disc to make Captain America's shield. 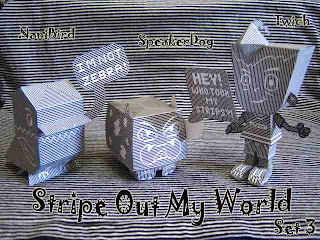 Go grab Zakane's third installment of his Stripe Out My World papercraft series. 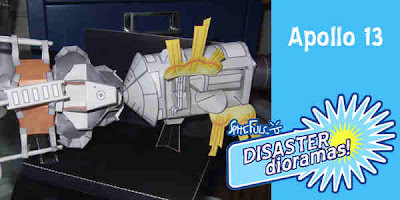 Here's a diorama depicting the Apollo 13 disaster. It was the third manned mission by NASA intended to land on the moon, but a mid-mission technical malfunction forced the lunar landing to be aborted. Its crew members were led by James A. Lovell wherein his radio transmission "Houston, we've had a problem", has become widely misquoted in popular culture as, "Houston, we have a problem". Jason Harlan has decided to make "Dollpunx" an endless series. That means he'll make model as he thinks of them and numbers them as he goes. 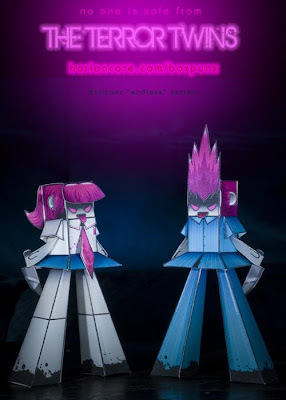 This series starts with Dollpunx 001 and 002, the TERROR TWINS. Kutars are popular Japanese internet characters made by GIGA-RENSYA. To celebrate their 10th anniversary, the site is offering the papercraft models of Kutar (orange), Cherry (white) , Smoke (black) and Navy (blue). 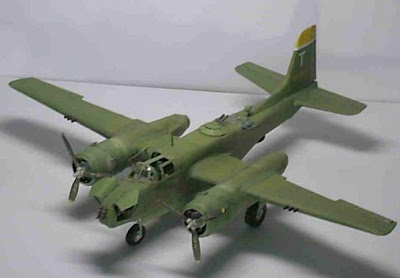 The Douglas A-26 Invader was a United States twin-engined light attack bomber built by the Douglas Aircraft that was used in the World War II. This airplane papercraft has a total of 23 pages of parts. The Sacred Forest Meadow is the most sacred area of the Lost Woods in Ocarina of Time. It is Saria's favorite place and can be only be accessed by following the sound of "Saria's Song." 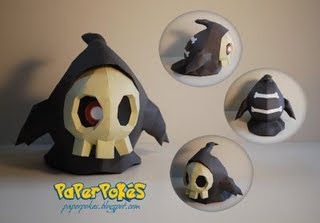 Duskull is a ghost-type Pokémon that sort of symbolizes death. It closely resembles the Grim Reaper. 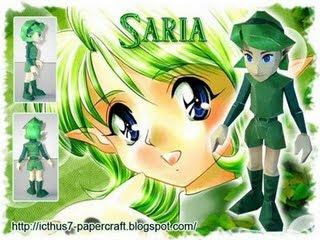 Saria is a Kokiri that was first seen in Ocarina of Time. The Kokiri tribe by the way is a group of children-like beings that protects the Great Deku Tree in Kokiri forest. She gave Link the fairy ocarina and later on helps him defeat Ganondorf. Check out these cool NASCAR papercrafts from Camille Morin. The blue car is the #46 RPM Special, Ford Fusion while the other is Canadian Tire series #27 Tide car of Andrew Ranger. Both are scaled at 1:32. The Rubik's Cube is a 3-D mechanical puzzle invented in 1974 by Hungarian sculptor and professor of architecture Ernő Rubik. 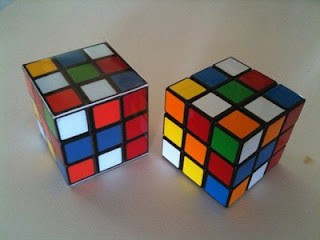 It was originally called the "Magic Cube." 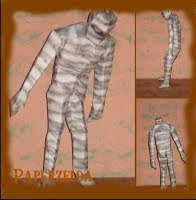 As of January 2009, 350 million cubes have sold worldwide making it the world's top-selling puzzle game. 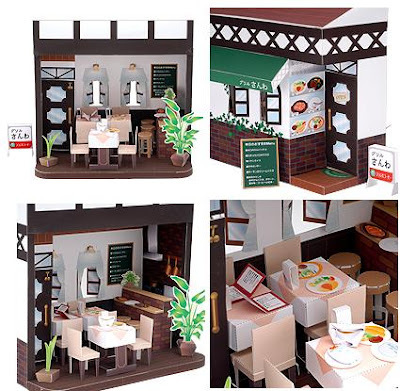 A restaurant has been added to the dollhouse section of Sanwa supply. 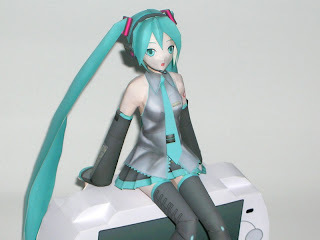 Hatsune Miku is the first installment in the Vocaloid 2 Character Vocal Series released on August 31, 2007. Vocaloid is a singing synthesizer application software developed by the Yamaha Corporation. Shinken Green is Chiaki Tani while Shinken Blue is Ryunosuke Ikenami. 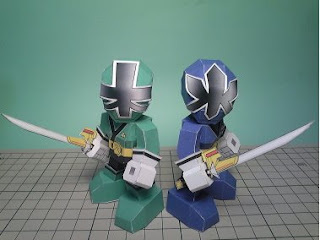 They are two of the six shinkens from Samurai Sentai Shinkenger Toei Company's long-running Super Sentai Series of Japanese tokusatsu television series. 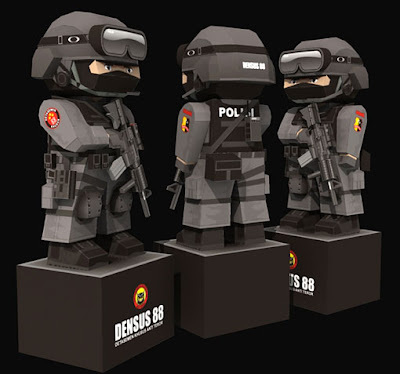 The Special Detachment 88 (Detasemen Khusus 88), Delta 88, or Densus 88, is the Indonesian counter-terrorism squad, and part of the Indonesian National Police. It was formed after the 2002 Bali bombing, and is funded, equipped, and trained by the United States. 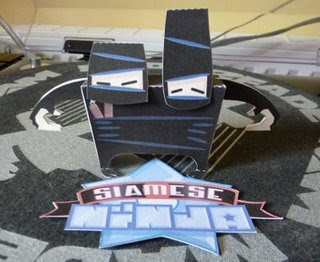 Here's another exceptional papercraft from Ninjatoes. 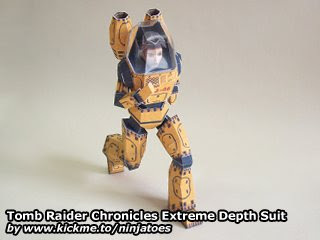 It's Lara in her extreme depth suit from the Tomb Raider Chronicles game. Meet Sid & Nancy, the music loving couple. 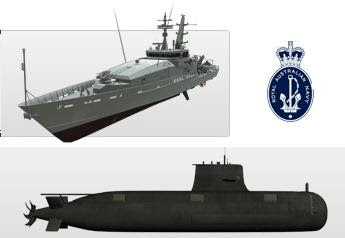 The Australian Navy has two paper models for you to build. There's the Armidale class patrol boat and a Collins class submarine. 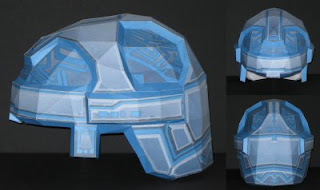 Build your own wearable helmet of Alan Bradley, the computer programmer of Tron. Looks cute and delicious at the same time! 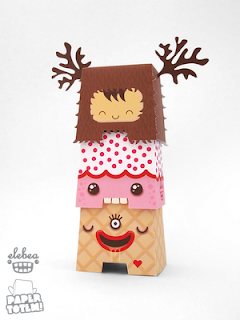 This is an awesome custom of paper totem by Argentinean designer Elebea. Here's the second version of Gibdo from the Ocarina of Time/Majora's Mask. 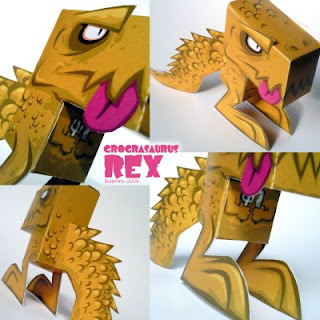 Here's a T-Rex inspired papertoy from Jerom. 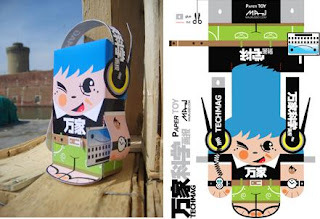 Check out this cool papertoy made by designer Mau Russo for the Chinese lifestyle magazine TechMag. 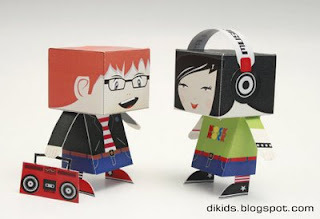 Learn to appreciate the simple things in life like this papertoy from Johnny Chiba. 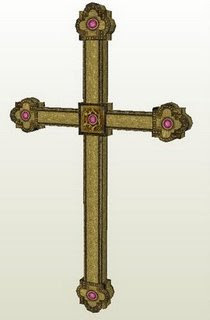 From TombRaider, this ancient cross is one of the golden artifacts found scattered in the ruins under the King Arthur's museum in England. 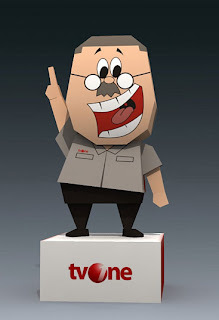 Bang One is the mascot or the icon of TV One, a privately owned television station in Indonesia. Chicken Little is a 2005 CGI family movie by Walt Disney. Its main character Ace "Chicken Little" Cluck, a young rooster, suffers under a reputation for being crazy since he caused a panic saying the sky was falling. 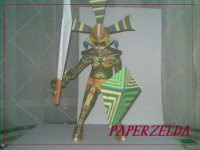 Zakane has added two more designs to his "Helmut " papercraft series. 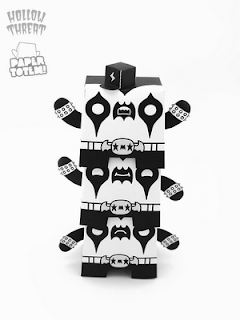 Check out these black and white themed paper totem by artist/designer Paul Shih. These heavy metal designs were inspired by Paul's Hollow Threat project. If you've played the Ocarina of time then you probably recognize this place. 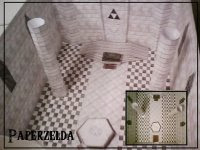 The Temple of Time is one of Hyrule's most ancient buildings and serves as the gateway between Hyrule and Sacred Realm. 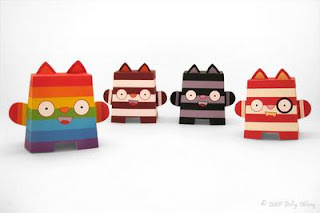 Check out these two cute pokemons from the guys at paperpokes. The one on the left is Cherrim while the other is Cherubi. Both are grass-type Pokémons. 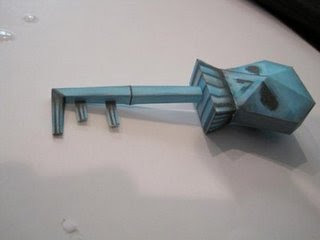 Here's a transformers inspired papercraft from Jonah Penne. 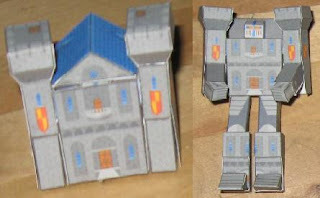 Castlebot is a medieval castle that transforms into a battle knight. 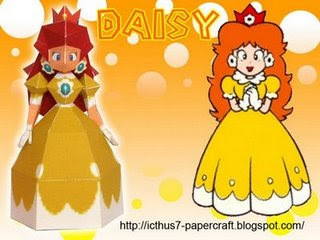 Princess Daisy is the princess of Sarasaland in the fictional world of Super Mario. 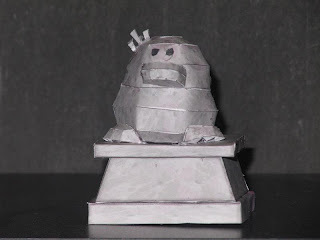 She made her first appearance in 1989 in Super Mario Land, in which she is kidnapped by the tyrannical alien Tatanga, who plans to marry her and rule her kingdom. Back to back Star Trek posts! Two ships have been added recently in the Star Trek section: The one on top is the Vulcan Sh'Ran type while the other is the Vulcan Maymora DSRV. In the fictional universe of Star Trek, the Terran Empire is the Mirror Universe counterpart of the United Federation of Planets. The evil Terran Empire was first introduced in the 1960's Star Trek television show entitled Mirror, Mirror. 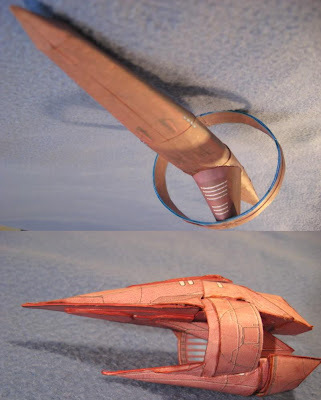 This is the papercraft replica of the knife that some of the Terran crew carry. Dolly Oblong's kitty family is complete. From left to right are bright 'n shiny Sunny, laid-back Ziggy, cute 'n cuddly Tommie and crazy Bang Bang. Meoww! Get ready for some action with the world's first and only existing conjoined twin ninja. This Raven statue can be found in Yoshi's village in Paper Mario. 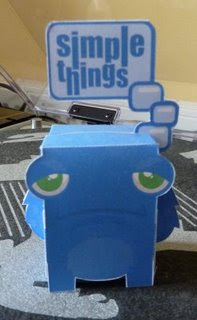 Are you a big fan of cubeecraft? 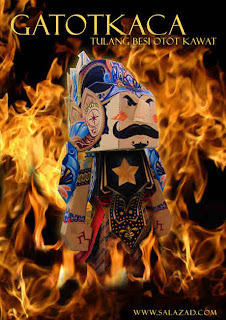 Then you might want to join the first cubeecraft fan club contest. It starts on July 20 and will end on October 5. This small key from the Twilight Princess is used to open locked doors. 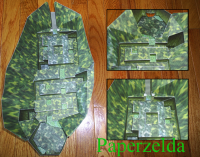 With just 3 pages of parts, the 36 cm long slicer papercraft comes with 6 skins. 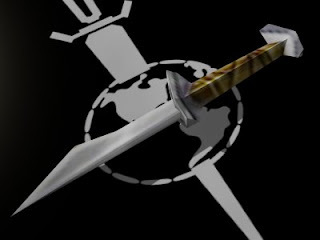 It is the same model is used in various "green" swords in game. 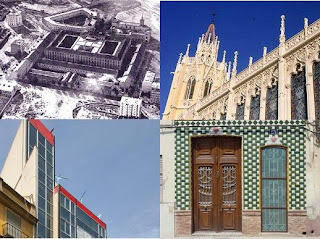 Build these four beautiful buildings found in Spain: La fabrica de tabacos, Colegio de arquitectos, Palacio de la exposición & Cabanyal - Canyamelar. 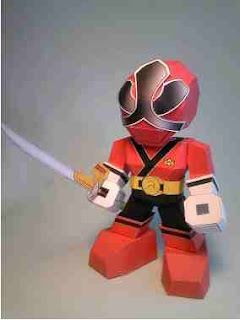 It appears that this one is called Red Shinkenger from the Samurai Sentai Shinkenger series. Thanks to anon for the info. Lara used this skull key in the Tomb Raider 3 to access the dense tropical jungle in the South Pacific. 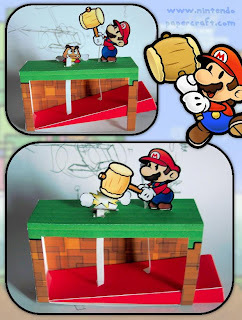 Watch Mario as he smashes a Goomba with a hammer with this cool paper automata from ddi7i4d. The Tonberry, sometimes known as Pug or Dinglberry, is a recurring enemy from the Final Fantasy series. It first appeared in Final Fantasy V, and has appeared in most games since. The Tonberry has since become one of the more recognized and formidable enemies in the series. 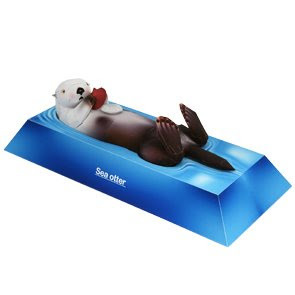 Here's a cute sea otter papercraft floating on the water designed by Katsuyuki Shiga (PinoArt) for Canon.